I don’t know about you, but when I read “Spring Food Sensations” on Abby’s blog, my mind immediately sprang to rhubarb. 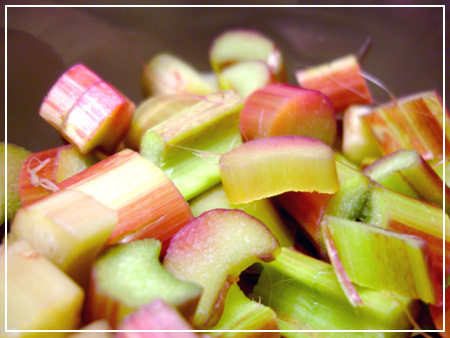 Rhubarb is to me the ultimate spring messenger, and a delicacy to boot! When I was little, I used to eat it in a preserve, or a sponge cake with rhubarb pieces on top (delicious!). But I never made anything with it myself – until now. Since I wasn’t in the mood to try my hand at spongecake, the BF suggested Strawberry and rhubarb crumble pie. 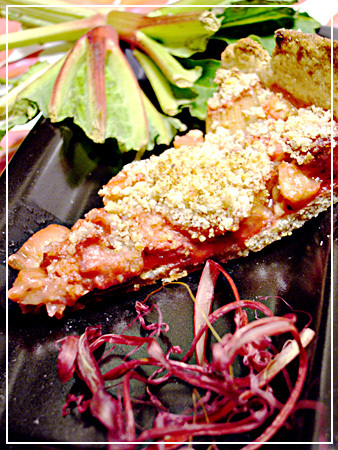 This pie can be made with or without a pie shell, but I prefer having something crunchy to whet my wererabbit teeth on. Peel the rhubarb and chop it into ca. 1cm wide pieces. Toss with the strawberries, sugar and flour – the amount of sugar depends on how much you want to offset the natural sourness of the rhubarb, the flour is to stop the liquid from going everywhere during baking. Fill into the pie crust. Mix the crumble ingredients until they become small crumbs. Spread them over the fruit using your hands – it just doesn’t get even with a spoon. Bake at 225 degrees Celsius for ca. 20 minutes. Enjoy with vanilla icecream or vanilla sauce. It was nice – in hindsight the pie crust should have been sweeter to contrast with the tang of the rhubarb better. I wonder how a marzipan crumble would work on top?! Not too happy about the picture (curse artificial light!) but the rest was eaten before I could get my camera in the morning. So have a bonus picture of rhubarb chunks. Speaking of spring – another of those spring messengers is my beloves asparagus! 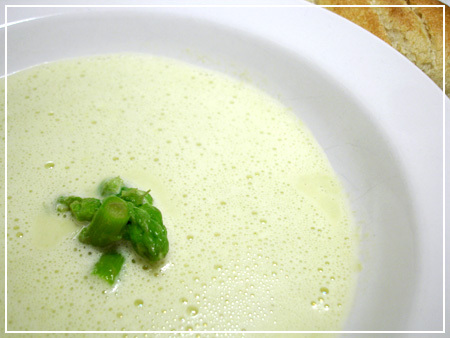 While the pie was cooking, I prepared a super-easy asparagus soup for first course. Blanch the asparagus quickly and cut off the tips to preserve for decoration. Chop the rest into chunks. Heat the oil in a pot and sauté the spring onions. Add the asparagus chunks, cream, and dissolved bouillon cube and boil for about 20 minutes. Puree everything with a hand mixer and salt and pepper to taste. Serve with the asparagus tips in the middle and croutons or fresh baguette. Super easy and you’ll never want instant soup again once you have tasted the real thing! 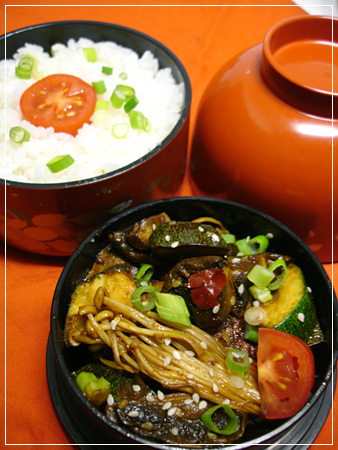 It contains fried tofu, mushrooms, enoki mushrooms, onion and squash all simmered in a spicy sauce and sprinkled with scallions and sesame. 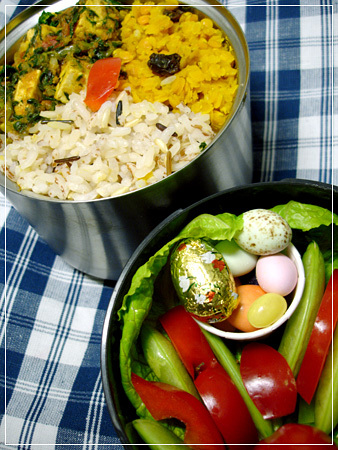 In the big container there’s rice, half a baby plum tomato and chives. The boyfriend gets the same but enjoys his bento in a more orderly and strict fashion (haha right, we’re both utterly chaotic people and proud of it!). He is also forced to eat more vitamins, aka sugarpeas, as you can see. The plants made if home safe and sound! And look how much they liked the change of air! This little fellow is stretching out his shiny new leaf for the world to see! The remaining plants from the greenhouse will be repotted soon as well; they grow slower, but also don’t get quite as leggy, so that might be good. 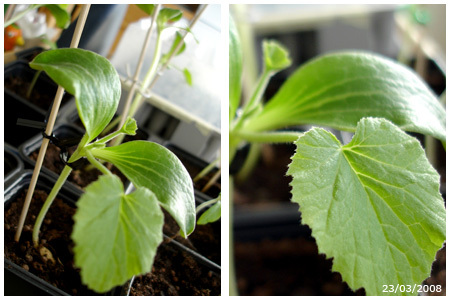 And the strawberries have sprouted a few hair-thin seedlings and were moved from their dark spot towards the windowsill (but are under a clear plastic pot for protection still). Photos shall follow. 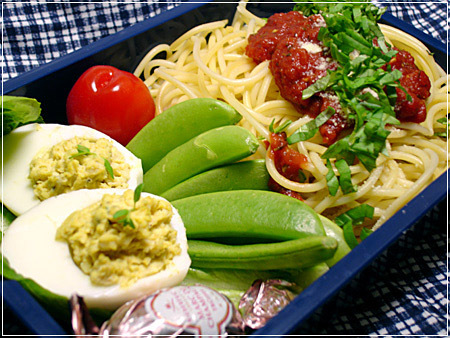 Devilled eggs on a salad leaf, baby plum tomato, sugar snap peas, pasta all’arrabiata with parmesan and chopped basil, chocolate easter egg. I’ve cooked quinoa several times now. I’ve found out that I rather like the nutty taste and texture of the grain. Since it has a lot of protein, it’s a welcome addition to my veggie kitchen. Yesterday, I’ve tried microwave cooking it, based on the assumption that if rice works, quinoa must work too. It got great, actually – it takes slightly longer than rice, about 10 minutes for a cup, and needs to be steamed off afterwards, but gets nicely al dente. I just have one problem: I can’t seem to find any really interesting recipes on what to do with it. It tastes well enough on its own, but the second I try to mix it into a salad it’s just not that great any more. Maybe it’s the dressing – vinaigrette doesn’t seem to work at all, and I’m not too fond of creamy dressings. With balsamic vinegar, it gets watery and bitter immediately, even if there was no bitterness in the original grain. Meeta posted a recipe for quinoa soup the other day, but I must admit that it just doesn’t speak to me. It’s not something I could imagine having on my place and eating with gusto. Sorry, Meeta! Then I have seen recipes that try to use it as a couscous or other grain replacement. But there’s something in me that’s deeply suspicious of “replacement” foods just because they’re better for vegetarians. I want something that celebrates the taste of quinoa in itself and adds other tastes to it that make a good flavour and texture combination. It does not have to be vegan, but it should be vegetarian. 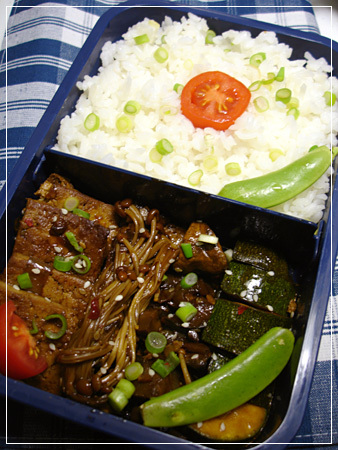 It can be any kind of food, otherwise – no restrictions at all! Is there anybody out there who can help me out with a nice recipe? Why do so many people complain that when they’re home alone or cooking just for themselves, they never make anything good? My mom never did that, and neither do I. After all, I count myself as the person who appreciates good food in the household (so does she), and why shouldn’t we make good food for just ourselves? These days, when I’m home alone, I make things I don’t usually make. The BF can be somewhat picky about food (boiled carrots? Beans? Nah.) and sometimes I do crave the stuff, or want to try out a new recipe I’m not sure he will like. So instead of doing double cooking, I put those on days where I cook alone – if it’s too much, I can always freeze single portions for later! There has been one dish that I’ve been particularly itching to make recently. My grandma sent me dried porcini mushrooms that a friend of hers has been picking in the forest – a little treasure! (Did you see how much those cost in the supermarket?) I’ve remembered that she used to make a potato and mushroom soup with them, and wanted to try my hand at tweaking the recipe somewhat more in favour of my tastes. The result? Quite good, so far. Rehydrate the porcini in boiling water, keep the liquid. Grate or cube the potatoes. Heat some butter and/or olive oil in a pot and saute the onion and leek in it. Add the raw potatoes, stir a few times and add the mushrooms with the water used to rehydrate them. Add stock (how much depends on how thick you want the soup to be in the end). Cover and simmer until the potatoes are cooked through. Puree everything in a mixer, or leave some of the potatoes and mushrooms out for a bit more bite to the soup (that’s what I did, because I like to have something crunchy in my soup!). Optional: Add cream or sourcream on top. It’s easy and tasty, just the right stuff for the returning winter here. I also added a grated carrot to my soup, but I didn’t find it did anything great for the taste. In fact, it distracts a bit from the goodness that is leek, potatoes and porcini.